Not every game that leaves an impression has a big, long story to go with it. Some are much simpler affairs, like Ghost House, which I thought an appropriate blog post for Halloween. I mentioned in my first Sonic the Hedgehog post a neighbourhood family whom my brother and I spent a great deal of time with. The two boys who lived at the house a few streets over were friends of ours for as long as we could remember, and their ages nearly coincided with my brother's and mine. In those years, they were one of the first families in the area to own all the new systems and games, and were one of the three places where I had my first exposure to most of the games that shaped my young consciousness (the others being my cousin and the teenager living across the street from me). One of the unusual things about the family was that they had a Sega Master System, an 8-bit system that attempted to compete with the Nintendo Entertainment System, but remained relatively unknown in the United States. Graphically, it was capable of displaying many more colours at once than Nintendo's offering, making it a graphical competitor. However, with only minimal support from third parties, and with Sega only really hitting its stride as a developer after the Sega Genesis was released, the Sega Master System remained something of an obscure offering, but it had its charm. The NES eventually came to live in the room of my younger brother, who was more my friend, while the Sega Master System stayed in the room of the older brother, who, as one may expect, was closer to my older brother. Generally, however, we were free to venture into his room to play the small collection of games they had. Really, the only Sega Master System games that stick in my mind are Action Fighter, Zaxxon 3D, Fantasy Zone II, Spy vs. Spy (a fantastic port of the Commodore 64 version), Double Dragon (featuring two-player simultaneous play and my favourite game on the system), and Ghost House. While most games came on cartridges, Ghost House came on this cool little card, much as games would later do on the Turbografx 16. The game's premise was simple and lighthearted, and the monsters were even more cartoony and less threatening than the ones in Castlevania. For me, fascinated with ghosts and monsters but terrified of anything scary, Ghost House was a dream. The game's premise is extremely simple. 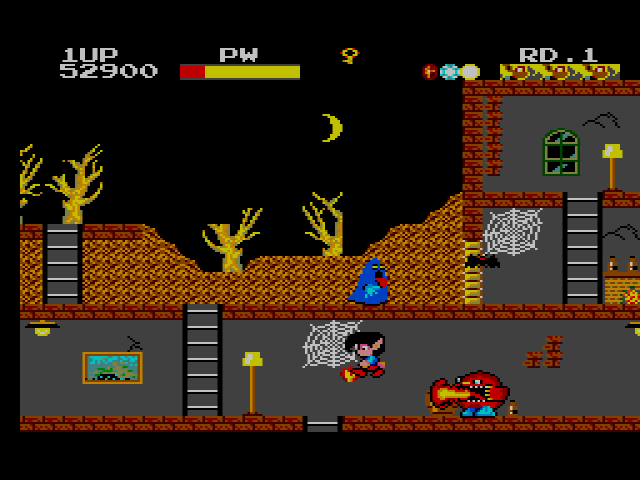 The main character is Mick, or 「ミッキー」(Mickey) in Japan, described in the game's manual as "the normal-looking guy in the blue shirt" in spite of his conspicuous pointy ears, which resemble those of Sega's mascot at the time, Alex Kidd. Mick has inherited the family jewels, which is good, but those jewels happen to be in the possession of Dracula, which is bad—and which also raises a bit of a silent question about Mick's pedigree. 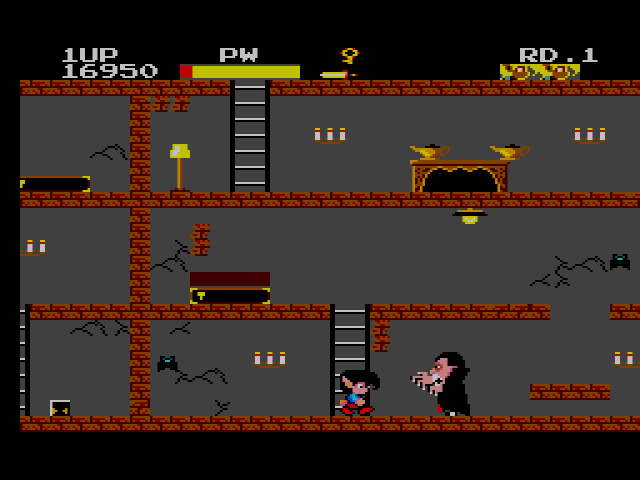 Mick, brave boy that he is, goes unarmed into Dracula's mansion to retreive the jewels, apparently confident that he can punch his way through whatever comes at him (which, suprisingly, he does a decent job of doing). Ghost House contains only one maze-like mansion, complete with a labyrinth of doors (that don't always lead back where they came from), and five monsters: a run-of-of-the-mill swoopy Derobat; the blue blob-like Death; the rotund Fire-Blowers; the creepy Mummy, which only appears in later rounds; and Dracula himself, who has to be let out of his locked coffin and defeated before he relinquishes the jewel he carries. Mick's straightforward goal of hunting Dracula is complicated on the surface by the fact that the vampire has four decoys, but this just serves as a means to give the player five Draculas to beat in each round, since each carries one of five jewels that are necessary for progression. Get all the jewels, and the game begins another loop, but with added difficulty. That is, more or less, the crux of Ghost House. The game is made a more compelling by challenging the player to be constantly observant: hidden pitfalls abound, detectable only by subtle differences in the brickwork; passing a candelabra causes a knife to be thrown at Mick from off screen, which can then be jumped on, collected, and used as a weapon; passing a brass genie-like oil lamp similarly causes an arrow to be fired, while jumping on enough arrows lends temporary invincibility; jumping and hitting the overhead lights causes all action on-screen to freeze; and, finally, the little "?" boxes dotting the area give a random number of points and cause a random amount of life to be replenished. All and all, it’s a simple game, one which I was finally, many years later, able to acquire the means to play again. And, while it's basic and repetitive, I find myself coming back to it now and again. Partly, I like it because it's goofy and colourful and has VERY catchy music. Partly, I like it because the gameplay is simple but challenging. And partly, I like the setting—a quick romp through a haunted mansion, taking only a few minutes of my time for a single adventure. The game's lack of an ending that I can find also makes it a simpler affair; there's no ultimate goal to reach. 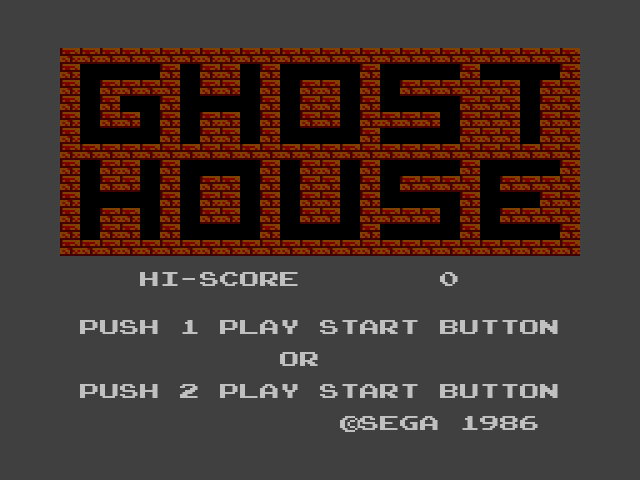 Most of all, though, I think I like the game because it's a curiosity, a single one-off Sega experiment on the Sega Master System—though apparently there is a similar arcade title that I know nothing about—a short spotlight for a long-forgotten Sega character and his haunted mansion, long before Nintendo's Luigi got a ghost house of his own. So, this holiday with its spooks and its candy and its costumes, let me tip my mask to the pointy-eared, normal-looking guy in the blue shirt. © 2011 Joshua D Savage. All rights reserved. All screenshots copyright of their respective owners. Awesome Inc. theme. Powered by Blogger.